Renuka Rajiv is an artist based in Bangalore. She did a diploma in Digital Video Production from Srishti School of Design, Bangalore, India(2007). She did a Bachelor of Fine Art, Printmaking from VCA, Melbourne (2010). She has participated in several group shows – The Brunswick Show, CBD, Melbourne (2010); EggEggEgg, White Elephant Artist Space, Brunswick, Melbourne (2010); Shoes 2, White Cube, Brisbane (2011); They’re A Queer Mob, Blak Dot Gallery, Melbourne (part of Midsumma festival) (2011); Launch, Brunswick Arts, Brunswick, Melbourne; Future Now, Substation, Newport, Melbourne (2011); Nature In The Dark, Fed Square, Melbourne (2011); Future Now, ICU, Castlemaine (2011); Energy In Stillness, Midsumma festival, Red Gallery, Melbourne (2013); Future Now: Traveling exhibition, (Cowwarr Artspace, Gippsland and B1 Contemporary, Ballarat) (2013); Unlikely Part 1 – Feral, Bella Union, Melbourne (2013); Bright Sparks, Firestation, Melbourne (2014); I Got You Under My Skin, Blak Dot Gallery, Melbourne (2014); Aspergers Vs. Parkinsons, Knight st Artspace, Melbourne (2014); Howl, Brunswick Artspace, Melbourne (2014); stutter in your eloquence, Backyard Civilization, Kochi (2014); Conspirators, Czech & Slovak Film Festival, Yarra Gallery, Melbourne (2014); Airdrome, The Hive, Bombay (2015); stutter in your eloquence II, Ambedkar University, Delhi (2015); Privacy to Piracy, Walkin Studios, Bangalore (2015); Group Therapy, Brunswick Artspace, Melbourne (2015); Exit, Brunswick Artspace, Melbourne (2015) andAt the turn of a Page, Vadehra Gallery, Delhi (2016). 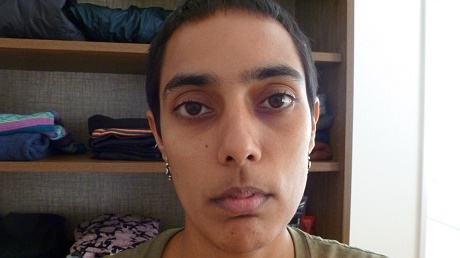 Her solos include – Life As a Solo, Handheld Gallery, Melbourne (2013); Wild Fermentation, Brunswick Artspace, Melbourne (2013); Static/Problematic, G159, Bangalore (2015). Renuka was artist in residence at CONA, Mumbai funded by INLAKS Shivadasani Foundation (2014), TAJ Residency/SKE Projects, Bangalore,(2015) and Walkin Studios, Bangalore (2015). Her publications include Silicon Plateau #01, a collaborative publishing project between T.A.J. Residency/SKE Projects + or-bits.com in 2015. She has received the City of Stonington Print Prize in 2010; the NGV Women’s Association Prize in 2010 and the Substation travelling exhibition prize in 2011.